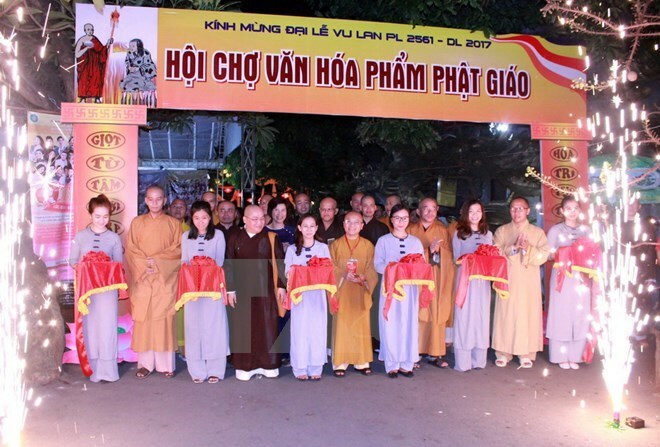 HCM City (VNA) – A Buddhist Cultural Fortnight began at Pho Quang pagoda in Ho Chi Minh City on August 21 to mark the Vu Lan (Ullambana) festival which is held annually in the seventh month of the lunar calendar to pay tribute to motherly love. Speaking at the opening ceremony, Venerable Thich Nhat Tu, head of the culture board of the Vietnam Buddhist Sangha’s Ho Chi Minh City chapter, said that Vu Lan, one of the two largest Buddhist festivals, is held to express gratitude to parents and ancestors. The fortnight includes an exhibition, a Buddhist cultural fair and a vegetarian cuisine fair. The exhibition showcases nearly 500 photos and calligraphic and sculptural works related to Buddhism. Meanwhile, with 31 booths, the Buddhist cultural fair introduces visitors to Buddhist publications, including scriptures, books, tapes, dishes and paintings and items of daily use in pagodas such as incense and candles.